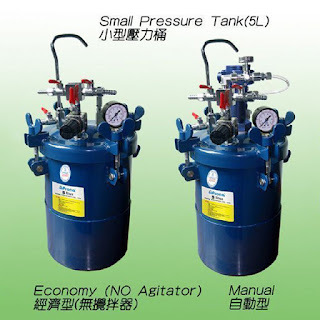 I bought a nice 5 Liter pressure pot online and had it shipped to Malaysia. It can hold a gallon container and actually has a pneumatic mixer that stirs the material without having to open the pot. I thought that was a silly thing but it turned out to be very useful. The biggest problem was the 100 psi pressure gauge. I need 6 psi to push the gelcoat to the gun. It was hard to get any type of exact reproducible reading at the low end of the scale so I got a 1 Bar (14.7 psi) gauge locally which has worked great. For the catalyst pot, I initially planned to use a 1 Liter HVLP pressure pot from a Harbor Freight spray gun. I adapted it and got it hosed it to the gun. The big problem with it was that air always leaked from around the seal and that MEKP is a highly corrosive oxidizer. The MEKP turned the aluminum and brass parts into chunks of scale which kept clogging the catalyst orifice on the spray gun. I even installed a motor bike fuel filter in the line as a band-aid fix but that didn't keep the catalyst turn grey because it was eating the aluminum. In the end, a new solution needed to be found. Either plastic or stainless steel seemed to like a good idea. When we were home last summer, I fabricated one almost entirely out of 316 stainless steel. I was fortunate enough to find a 100% 316 stainless 1 bar gauge and a nice 316 chemical reactor vessel. I had to drill and tap 2 holes in the top. One for the air supply and one for the pickup tube. The brass pieces below and to the left of the gauge make up the calibrated orifice. The double regulation gives a much more stable pressure at such a low pressure (2 psi).